One of the more underappreciated rock artists of the early to mid 1950’s whose output for a variety of labels was consistently solid but whose versatility may have kept him from establishing a firm musical niche to exploit and left his legacy in any one area somewhat lacking. Dixon was born in 1929 and was one of many Texan raised pianists of the 1940’s who left for California to find a measure of fame and fortune in the Los Angeles clubs and on the many independent record labels which sprang up in the City Of Angels during the decade. 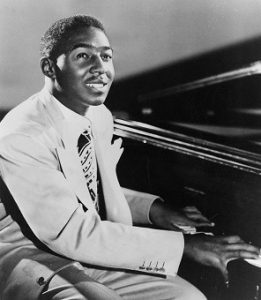 Like many of his brethren he was influenced by Charles Brown, who was among the first to make the pilgrimage to the West Coast and whose specialty was cocktail blues, a more poppish, slightly jazzy style which had made considerable inroads commercially during the mid-1940’s, thanks in large part to Brown’s work with Johnny Moore’s Three Blazers. After winning an amateur talent contest at The Barrelhouse Club the club’s owner, session musician and bandleader Johnny Otis encouraged him to record and Dixon wound up at Modern Records where he cut “Dallas Blues”, a pure blues song that hit the national charts while Floyd, who had only just turned twenty years old, was still earning his living working at a drug store. In spite of the record’s success Modern immediately had him alter his approach and placed him squarely in the rock field, which is where the majority of his output over the next decade belongs. Yet he remained comfortable in a wide variety of genres, including being able to emulate Charles Brown’s crooning vocal style, and would in fact become one of a handful of singers who recorded with The Three Blazers after Brown left the group. Before that he also cut sides with Eddie Williams, the bassist for The Three Blazers, under the offensive group name Eddie Williams And His Brown Buddies, which were also done primarily in the rock idiom. Because he was able to credibly execute any style though his body of work didn’t always follow a predictable path, something exacerbated by frequent jumping from label to label each of whom might aim him at a slightly different audience. As most of these companies were located in California, even though they had the reach to score national hits, it wasn’t until arriving at Atlantic subsidiary Cat Records in 1954 that he was as heavily promoted in eastern cities as he had been in the western and southern states which may have further impacted his popularity as his reputation across the country never equaled that which he enjoyed on the West Coast. As with many rock artists whose most significant work was done in the years prior to the music’s crossover into white America in the mid-fifties, his lack of a reputation with that audience forced him to move back into blues circles in later life. He toured internationally in the latter third of his life bringing him renewed attention, as did The Blues Brothers covering his 1954 classic “Hey Bartender” on their best selling 1978 album ad he was even contracted to write a song for the 1984 Olympics held in his professional home town of Los Angeles. While his own recording career had an unexpected second act by the 1990’s and he received The Rhythm & Blues Foundations Career Achievement Award along the way which led to him playing various blues and jazz festivals, he never got any official recognition for his most substantial work as a rock artist and thus his place in history has been unjustly relegated to the fringes. Dixon kept playing music, whatever you called it, until the very end, filming a concert in June 2006. He died just over a month later at the age of 77. As member of… Eddie Williams & His Brown Buddies.